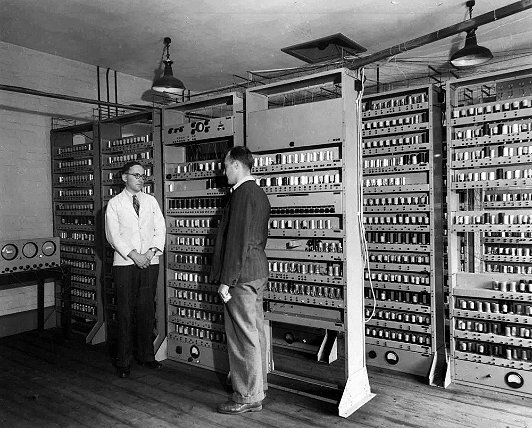 Today in 1949, the Electronic Delayed Storage Automatic Computer (EDSAC), the first practical stored-program computer, ran its first program and performed its first calculation. “… a thin ribbon of paper containing the program [to print a table of the squares of the integers] was loaded into the computer; half a minute later the teleprinter sprang to life and began to print 1, 4, 9, 16, 25…. The world’s first practical stored-program computer had come to life, and with it the dawn of the computer age,” Martin Campbell-Kelly and William Aspray recount the moment in Computer: A History of the Information Machine. A working replica of the EDSAC is being constructed at Bletchley Park, England. This entry was posted in Computer history, This day in information. Bookmark the permalink.